The University of the Witwatersrand Centre of Excellence (CoE) programme is an initiative of the Department of Science and Technology and the National Research Foundation and aims to “concentrate existing research excellence, capacity and resources, to enable researchers to collaborate across disciplines on long-term projects that are locally relevant and internationally competitive”. 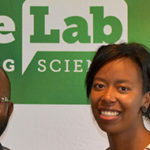 The Centres of Excellence in Palaeosciences, Strong Materials, and Mathematics and Statistical Sciences came together to participate in FameLab SA. Phylis Makurunje and Aviwe Matiwane both won places in the semi-finals! Phylis is a PhD student at Wits under the CoE in Strong Materials. Her research focusses on aerospace materials, working towards increasing the speed of travel by utilising materials that can withstand such harsh flight conditions. Aviwe’s research is under the CoE in Paleo Sciences; she is studying through Rhodes University and is based at the Albany Museum. She is researching plants from the Middle Permian, developing a database that can be used worldwide to identify plant species from this period. Jive will be tweeting live from the semi-finals, follow @JiveMediaAfrica and tweet us with the hashtag #FameLabSA to show your support for Phylis and Aviwe! 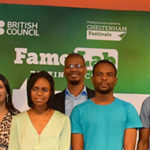 Phylis Makurunje and Aviwe Matiwane both won a place in the national FameLab semi-finals!